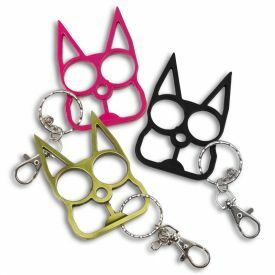 Isn't it about time that you could take a versatile tool with you without looking like you've got a weapon? That's what the Red Multitool Credit Card Knife does for you. 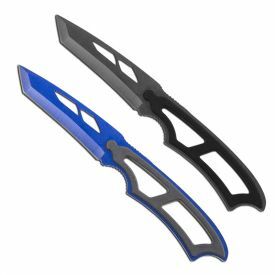 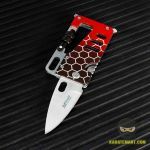 If you want a multipurpose knife, then look no further than the folding knife that has the dimensions of your typical credit card when folded up. Measuring 3.25" by 1.75", the red handle not only hides the 2.5" steel blade, but also has two screwdrivers (a flat head and a Phillips head) and even a bottle opener! 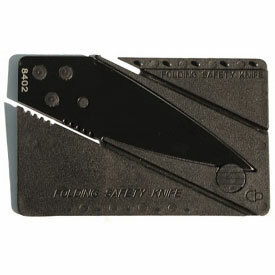 This multitool credit card knife is like a Swiss Army knife without the swiss army. 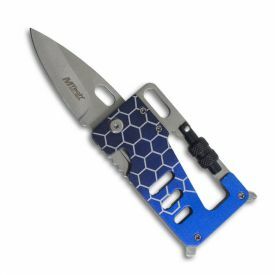 The handle is a quarter of an inch thick, which is probably a little too thick to hold in your wallet's credit card slots, but you can use the carabiner to attach the knife to your keychain or the harness you use to climb mountains. 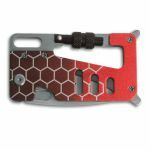 If you want a handy multi-tool knife that does multiple jobs so that you only need to carry one item, then the Red Multitool Credit Card Knife is just the folding knife for you.